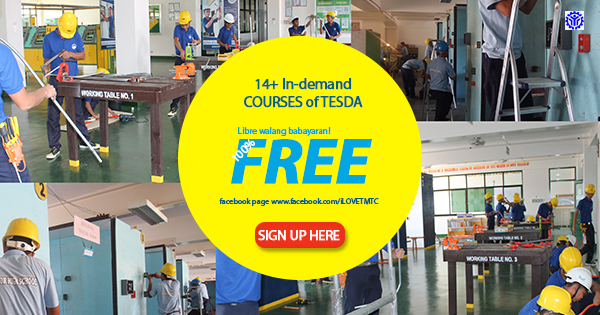 The City Government of Taguig released an in-demand course of TESDA. Free Training courses and requirements are posted here. If you're a registered voter in Taguig City. Go to Taguig City Manpower Training Center there in-demand courses that you might have been looking for. 3. BRGY. Clearance (Original) For Tesda requirement purpose (must be updated). 4. 1 pc. 2x2 picture White background (with a name). 5. 3 pcs. 1x1 picture white background. For more inquiries, Please call 0936-195-3848 / 824-63-16 or visit the office located at Ballecer St., Central Signal Village Taguig City or Visit facebook page www.facebook.com/iLOVETMTC. Please comply for all the requirements upon enrollment.